Big Bend Yoga is located 1.5 miles south of Manchester on the corner of Gore and Kirkham and can be reached easily from I-64/Hwy. 40 and Brentwood Boulevard (South) or I-44 and Elm Street. Parking is available in the lot and on adjacent streets. The Dance Center of Kirkwood easily accessible from I-64/Hwy. 40 and Lindbergh Boulevard, I-44 and Lindbergh Boulevard (South), and from Manchester Road. Studio 3 is facing Woodlawn Avenue and is located just behind Winfield's Gathering Place. There is no sign from the street. 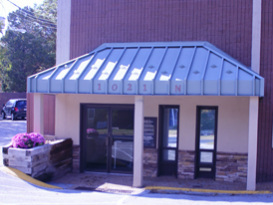 The entrance is located under the green awning which can been seen from Woodlawn Avenue. Parking is available in the immediate lot or in the large lot facing Manchester Road.